Many Shinkansen trains stop in Fukuyama. While the city itself is an uninteresting industrial town, it is convenient to change for local trains and buses to the spots introduced below. A chain of small, unspoilt islands offering beaches, hiking, marine leisure and old fishing villages. The only complete port ensemble from the Edo period. 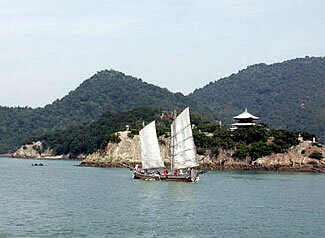 The beauty of the moon-shaped harbour and small islands has long inspired poetry. JR Sanyo Line in direction of Mihara, Hiroshima. Get off at Kasaoka (40 min.). JR Sanyo Line in direction of Okayama. Get off at Kasaoka (15 min.). From there, signs to "International Villa Shiraishi" will take you to Kasaoka Port. Kasaoka Islands, which are located in the west part of Okayama, form an island chain that is part of Kasaoka city and it's composed of a little over 30 uninhabited islands and 7 inhabited ones. 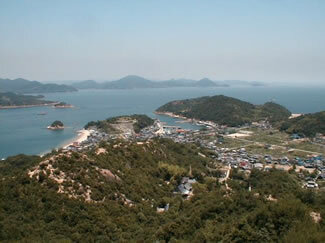 It's also located in the center of the Seto Inland Sea. The islands support 3187 residents in total (as of 2002), however the population has been getting smaller and smaller. Fishery, stone dealers, and tourism are the main businesses and some people work in companies too; however most of the people are living on their retirement pension. Each island has its own originality and you can enjoy the islands' different atmospheres each season. Almost all the islands have beaches and the meals are pretty much based on the fresh fish. There are some islands with designated hiking paths and you can enjoy the great view from the top of the mountain. Although all islands are worth visiting, we will introduce mainly two, Shiraishi and Manabe. Shiraishi Island is located 16km away from the main island. There are 7 accommodation facilities and some camp sites and sightseeing fisheries. This island is also a great spot for hiking and marine sports. As for the traditional Japanese culture, "Shiraishi odori", a traditional dance specified for the national intangible cultural asset is held in August. Since Okayama Prefecture built the International Exchange Villa on the island, about 1200 foreigners come to visit here every year. Activities: at the beach on the Northern side, you can not only swim but try kayaking and windsurfing. It is possible to arrange sailing and fishing trips; check the webpage of Amy Chavez below. Manabe Island has a population of 390 and it's located 32km away from the Kasaoka Port. Fishery, aquaculture, sightseeing and agriculture are the main industries. This is the last stop of the ferry line from Kasaoka. You will find a traditional fishing village and even an old wooden school building. Activities: stroll through the old fishing village on the Northern side. Near the port, there is a fish restaurant famous for its freshness - don't go there if you don't like your food moving around, but otherwise, you shouldn't miss this new dimension of fish delicacy! It is possible to take a motorboat cruising trip to Manabe from Tomonoura which includes a delicious fresh seafood lunch. Cruises are run by Kazenootosha . Okayama Prefecture International Villa Shiraishi. This is one of five international villas in Okayama prefecture. They allow foreigners (and accompanying Japanese) to stay in traditional or specially designed houses, with cooking facilities for a very reasonable price. By bus from Fukuyama station. Cross the traffic light at the right side of the South (Central) Exit. Buses run every 15 minutes from the first busstop after the traffic light, in front of Starbucks (30min.). 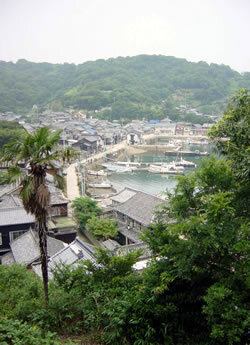 Tomonoura is located in the center of the Seto Inland Sea and it's a harbour town with 6000 residents. 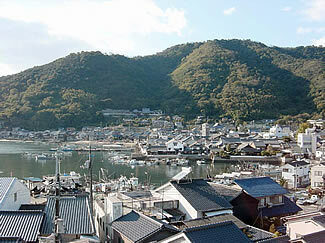 It's a wonderful, natural harbour, and Tomonoura, which had flourished as both a harbour and a town through the Middle Ages and the early modern ages, still has covered alleys, an old lighthouse, a wharf and dockings, as well as other historical heritage letting us feel the depth of the historical culture in the whole town. And you can also enjoy the rich life-style that the modern society has forgotten through Tomonoura's original life-style, work, humane feelings and the taste which were born in the rich flow of time. Walk through the old town, visiting temples, shops and cafes in historic houses, an nostalgic shop with boat equipment (Sawamura boat shop ) and a rich merchants' house (Otake-jutaku ). Enjoy the view of the small island Benten-jima from Fukuzen-ji Temple , like the Korean ambassadors did when they stopped here on their way to Edo in the 17th Century. Or walk up to Io-ji Temple to look over the port. Since 2002, a citizens group has been actively renovating old houses that had fallen empty and found new uses for them. The island opposite Tomonoura, called Sensuijima, can be easily reached by the small ferry crossing regularly. On the island, you will find a beach, a campsite, hiking courses, cute Tanuki (Japanese badger) and accommodation. It is also possible to try out kayaking in Tomonoura if you make a reservation with Setouchi Seakayak Adventures. Kazenooto-sha (stands for "Sound of the Wind") runs half-day cruises (capacity up to 12 persons/cruise) from Tomonoura to some islands, eg. Manabe and Yuge. Prices start from around 10.000\ per person depending on the number of guests. Some plans include a specialty lunch made from fresh fish, sea food and other carefully prepared local ingredients. Plans can be modified for your interest and circumstances. Several-days charter cruise plans are also available. For details, please contact in English via e-mail. There are several large and comfortable Ryokan in Tomonoura. From May to November, boats run on weekends from the pier in Tomonoura to Onomichi 4 times a day, following the coast of the Numakama peninsula. The one-hour ride gives you a pleasant rest between visiting two port towns, Tomonoura and Onomichi.